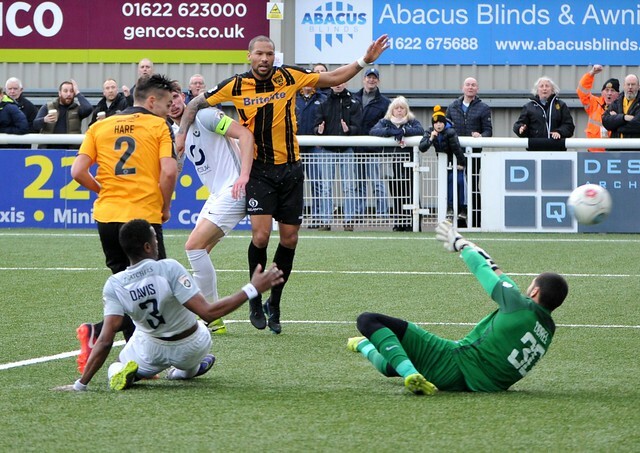 Maidstone United must wish they could play Torquay United every week. The Stones’ last victory in the league came 18 matches ago at Plainmoor and since then, one of Maidstone’s rare wins in cup competitions also came against the Gulls. This was a nervy afternoon for the Stones but having now finally broken their winless streak, Maidstone are eight points ahead of the relegation zone thanks to a winner from Josh Hare which came just two minutes from time much to the relief of the home supporters at the Gallagher Stadium. The first half was largely uneventful and it took a little while for there to be any meaningful action. On 20 minutes, Torquay had two corners in succession and from the second one, Luke Young whipped the ball towards the near post and to Scott McGinty whose glancing header only just cleared the bar. Then shortly after this, it was Maidstone’s turn to go close. Jack Paxman slipped the ball into Blair Turgott but Vincent Dorel in the Gulls goal was quickly off his line and he made a good block to deny Turgott. The only other opportunity of the half came on 38 minutes. Turgott ran down the right side of the box and from a tight angle he did well to get a shot away which stung the hands of Dorel. As the game moved towards the hour mark, the tempo from both sides increased slightly. A long clearance from Lee Worgan came to Jack Paxman who rolled the ball into the path of Hare. Hare’s deep cross was headed down by Joe Anderson and as Ross Lafayette tried to get a touch, Dorel just got the ball away from the line. Worgan was then involved again just two minutes later. This time, Elliott Romain suddenly found himself in space inside the box and he picked out the unmarked Connor Evans who headed the ball back across goal only to be denied by a superb save from Worgan. By now, Jay Saunders had introduced Jamar Loza and some individual skill from Loza on 77 minutes nearly broke the deadlock for the Stones. Loza tricked his way his way into the box and into space and his rising effort was pushed over the bar by Dorel. Then a minute later, Loza played a square ball to Lafayette. Lafayette was just outside the box and although his shot was on target, it was at a nice height for Dorel who once again, tipped the ball behind for a corner. But with 88 minutes on the clock, Maidstone finally made the break through after looking the stronger of the two sides in the later stages of the game. Anderson put in a good cross from the left which Lafayette headed against the post and Hare was on hand to stab the ball in from close range. The Stones then had to see out four minutes of stoppage time and in the 91st minute, they were fortunate not to concede an equaliser. The ball came to substitute Jon-Paul Pittman who spun into space inside the box and with the goal at his mercy, he somehow dragged his shot wide and with it, any chance Torquay had of getting something from the match. Maidstone United: 1. Lee Worgan, 2. Josh Hare, 22. Will De Havilland, 28. Dean Beckwith, 3. Alex Finney, 13. Joe Anderson, 5. Alex Wynter, 14. Jai Reason 10. Jack Paxman (7. Jamar Loza 60), 19. Blair Turgott (4. Reece Prestedge 90), 29. Ross Lafayette. Subs not used: 17. Darius Osei, 35. Andre Coker, 37. Michael Phillips. Torquay United: 30. Vincent Dorel, 21. Aaron Barnes, 14. Jakub Sokolik 6 (6. Josh Gowling 45), 5. Sean McGinty, 26. Conrad Balatoni, 3. Liam Davis, 8. Luke Young, 24. George Dowling, 29. Connor Evans (11. Jake Gosling 89), 22. Elliott Romain 6 (9. Jon-Paul Pittman 80), 39. Brett Willams. Subs not used: 1. Ryan Clarke, 19. Jamie Reid.